Often called “the fastest sport on two legs,” lacrosse varies from low to very high intensities, relying on all the major energy systems. 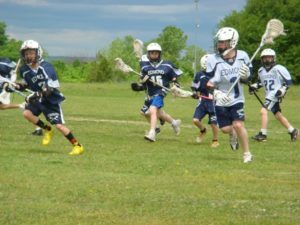 Elite lacrosse athletes need a combination of physical and mental traits to be successful: strength, speed, agility, and endurance, quick reaction time, fine motor skills, and sharp focus. Improper diet or refueling can lead to deficiencies in these areas as well as leaving the athlete vulnerable to injury. 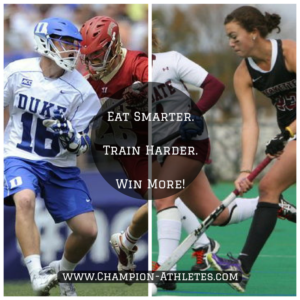 Fueling for lacrosse requires consistency to keep up with the demands of the sport. Whether it is because of a lack of time or neglect, many athletes skip meals and fail to hydrate fully, leading to fatigue, heavy legs and muscle cramps. Having a plan in place for fueling and hydrating will ensure that your body stays strong and recovers well through all phases of training. The primary fuel for a lacrosse player during competition is carbohydrates. In order to compete optimally a lacrosse player requires 40 to 60 percent of their daily caloric intake to come from carbohydrates, 20-40% from protein and 15-25% percent from fat. In other words, your diet should be nearly 50% carbohydrates and 50% protein & fats, with an emphasis on healthy fats. Not all carbohydrates are created equal. A whole wheat bagel is a better option than a doughnut. Pasta and sweat potatoes should be chosen over fried foods like french fries or breading on fried chicken. Lactic acid build up and cramping is also a big concern for many lacrosse players. With proper nutrition and supplementation cramps and muscle fatigue can be greatly reduced or eliminated all together. Our certified staff has under gone some of the most rigorous training available, including the USADA drug testing program. This gives our clients the peace of mind that our programs and supplement recommendations will never interfere with high school, NCAA or professional regulations. In addition, proper hydration is crucial for athletic performance. Dehydration can cause over-heating, reduced reaction time, cramps, muscle tears and decreased strength and endurance. Hydration isn’t just for practice and games, staying hydrated all day is very important. It is also important to understand that hydration is cumulative and must be part of your daily nutrition program. Sports & Position Specific- We take into consideration the energy and hydration demands of each individual sport. We also take their specific position and playing and practice time into consideration. 100% customized- Each of our plans is 100% customized for each one of our clients. Foods you like and eat- Unlike other nutritionists that hand you a food journal and generic foods, we design our programs with foods that you enjoy and that are readily available to you and your family. Support 7 days a week- We provide daily coaching. Each of our clients has access via text, phone and email to our staff every day. If you have a problem, cheat on the plan or have a question you can reach out at any time! We will help you every step of the way. Contact us today to take your game to the next level!